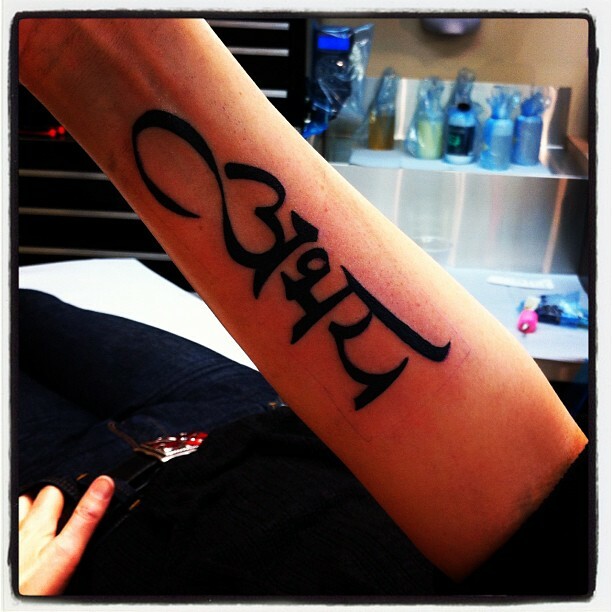 The sanskrit word abhaya means “fearlessness” … a state of steadfastness in which one is not swayed by fear of any kind. It is typically symbolized by the mudra in which the right hand is raised to shoulder height with the arm bent and the palm facing outward with the fingers together and upright. It represents protection, peace, benevolence, and the dispelling of fear. This gesture represents facing your enemies unarmed and demonstrating an intention to approach the encounter with confidence, strength, boldness, compassion, and a desire to find peace. When I tattooed this word in bold black ink on my forearm about a year ago … I felt as if it instantly became part of my body … like it really should have been there all along. As soon as I saw it stencilled on my skin … I knew it was right. At the time, it was a powerful statement about how I wanted to enter the next chapter of my life … a reminder to myself that I could face the future with a sense of openness and adventure rather than fear. I tattooed it on my right side … my warrior side … the side governed by Shiva (the sun) and dominated by masculine energy that is responsible for mental and physical strength. I have since balanced it out with the lotus that is now on my left side but … that is a tale for another day. Today’s tale is of abhaya. When I look at that word on my skin … I experience it as a challenge. It says “don’t you dare live in a way that is not extraordinary … be brave … move forward … don’t let fear paralyze you … open your heart and jump in!” I need that reminder now. The decisions I am facing are so huge that I feel myself slowing down as I move ever closer to the jumping off point. I let myself get distracted by manufactured and habitual fears until they bind me in their sticky, tangly webs and I forget to take the next step. I stand immobilized while I follow them down all the familiar wormholes in my brain … questing for certainty that can never be provided. Fear is the greatest resistance in one’s life and shows no discrimination from one moment to the next. No matter how much you desire an outcome … if you have fear towards the journey, the outcome, or anything in between … you are almost sure not to achieve it. A state of fear even has great potential to lead you down a path that you never imagined … a place stagnant and devoid of love! Where there is fear there is no love and where there is love there is no fear. So be fearless in all action, in every moment! In my situation … I am letting fear hold me back and I’m not enjoying the experience. At all. I’m feeling it as darkness in my body, heart, mind, and soul. I am stagnant and far from peace. But … there is love to be had. I know there is. I may not know the ultimate shape it will take and may not have a map in my hands that will allow me to complete the journey in some linear, predictable way. But it’s there. It’s waiting for me to make my next move.